If you’re on a mission to complete your UFOs (Unfinished Objects) and Sewing Projects, you’ll love this blog! It’s overwhelming to think about how fast time flies; it seems like this year has flown by so fast. However, I know it’s good to keep busy, and life certainly keeps me busy! Like most of you, I enjoy setting goals for the new year – and often find myself doing this several times a year just to stay on top of things. For 2018, I decided to set a goal to work on my UFOs. Those of you that sew a lot probably know what that stands for – UnFinished Objects! If you are a sewer or crafter of any kind, you probably have a few UFOs of your own hanging around. I hate to admit it, but I have quite a few. In fact, I have three big bins marked “UFOs #1,” “UFOs #2,” and “UFOs #3.” However, what’s worse is I’m sure there are more than that! Interestingly enough, most of these projects only needed a small amount of work to be completed. Figure out how many UFOs I actually have. Set a deadline to finish them. Get to work on getting them done. In UFO bin #1, I found four different projects to complete. Luckily, they were easy to finish and fun to work on! Project #1: My sister sent me a pattern for what I call a “snap bag.” Many of my sewing students have made them over the years. I love them, and they are fast and easy to make. One of my sewing students gave me this fabric. It was leftover from one of her previous projects, and I had enough to make two. Project #2: This project entailed finishing a small and cute drawstring bag. Again, a student had given me this small piece of fabric, and I had wanted to use it to make a bag to put my shoes in so I could put it in my suitcase while traveling to and from my mom’s house in Idaho. 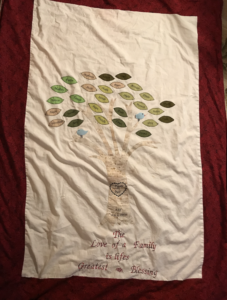 This project was almost done – it took me just 5 minutes to finish! I love the fabric, and I know my shoes will be happy when I travel. Project #3: My daughter decided that the colors of her new kitchen would be green. 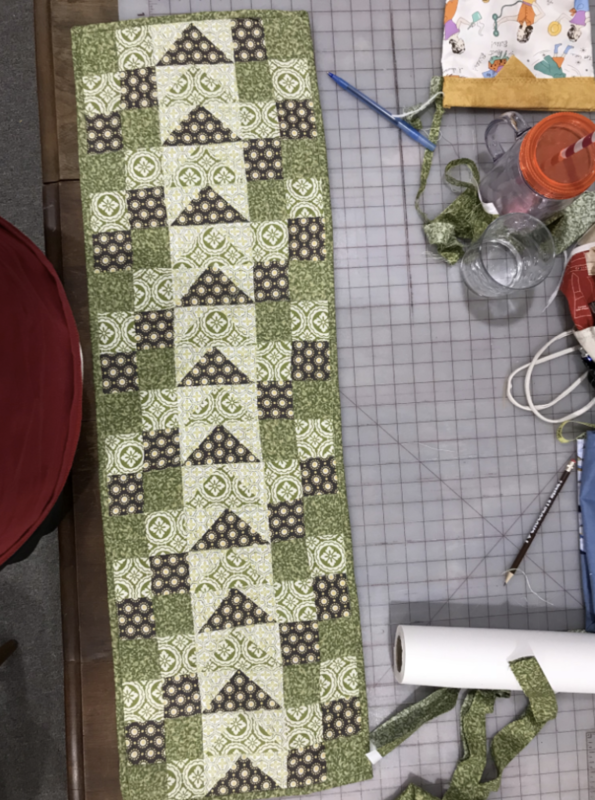 So I made her an apron, and started a table runner in that color. And then she changed her color to turquoise. 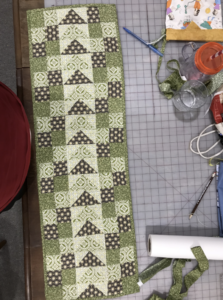 As you can imagine, I never finished the table runner. However, I realized her dining room table is separate from her kitchen, and the colors in the room are fairly generic. So I decided to finish it. Project #4: I made an advent calendar for my daughter years ago, and it just needed refreshing. Numbers had fallen off, and animals (and their eyes) had gone missing. There you have it! In a flash, I already have four of my UFOs finished. So, my challenge to you (if you want to join me) is to start finding and finishing your own UFOs! Sewing Tip: It can be so much easier to let UFOs intimidate me and to let them go unfinished. That’s because my brain often tricks me into thinking they’ll take WAY longer to complete than they actually do. But, as you can see, I finished all four projects in under two hours! My advice to anyone is simply to take courage and start the process of finishing your UFOs. You’ll likely be surprised at how fun they are to finish – and how little time it takes to do so! Next month, I’ll let you know how well I did on completing my goals. Happy New Year, and good luck to those of you that choose to join me on my quest to conquer UFOs! I LOVE My New Handsewn Ironing Board Cover! Did you know? I now have a brand new ironing board cover! 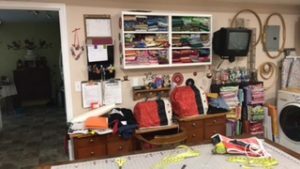 Redecorating my sewing studio has been sew fun! I began decorating the walls, then made brand new sewing machine covers, as well as a beautiful and functional new seawing apron. 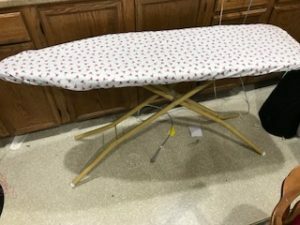 I thought I was set, until I realized – I could use a new ironing board cover! Pictured below is one of my original ironing board covers. I’ve loved having it, and it’s gotten a ton of use over the last three years. Three years ago, I covered all of my ironing boards with the same material. I then separated them by type: one for clothing, one for making quilts, and a third for everything else. 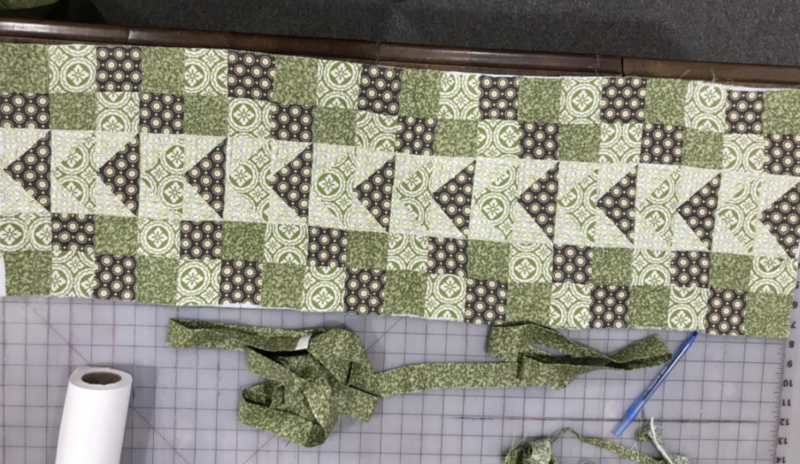 I chose the one for quilts specifically because it has two square ends (rather than rounded ends), making it much easier to iron large pieces of fabric. 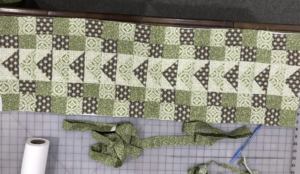 Sometimes, I need two quilting boards just for one sewing class! 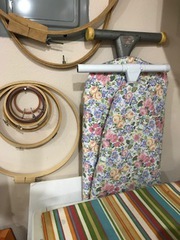 Unfortunately, ironing board covers really don’t last long in my studio since my students and I are constantly ironing our projects every single day. As you can see, my original cover now has a very large burn due to all the heavy traffic! As such, I thought it was high time to sew a new ironing cover to replace my old, burned one. Luckily, ironing board covers are surprisingly easy to sew! Plus, the fun part is picking out fabric to really make it your own. You can even choose material that matches your decor. For my new ironing board covers, I chose a pattern with red and black scissors on it. 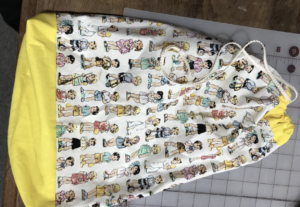 You can buy patterns at a fabric store, get them online, or just make them yourself. 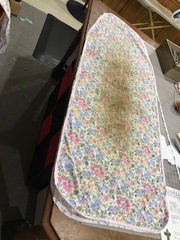 To begin, I took my old ironing board cover off, laid it on top of my new fabric, and cut around the edges so that it would be the right size. Then, I placed bias tape over the edges of the fabric. The brand I buy contains iron-on tape on both sides, so I just ironed the tape onto the fabric, and then sewed it on to keep it in place. I then threaded string into the casing that was formed after sewing on the bias tape. I pulled the string tight, and then laid it onto the ironing board to tie it. Easy as that! 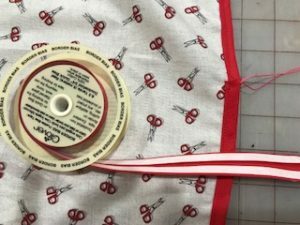 Sewing Tip: The bias tape I used for this project has iron-on tape on both sides. This makes my projects go much faster, with very little stress! However, there are brands out there that don’t offer this feature – and I could have wasted a lot of extra time and hassle had I not known! When you’re selecting new sewing supplies, I suggest doing your research first, looking at reviews of the products (if you’re online, specifically on Amazon), and seeing if there’s a brand out there that works more efficiently than the others. Even if it’s a little more expensive, trust me – you’ll thank yourself later! Slowly but surely, my studio is coming together. Stay tuned for details on my next sewing project: handsewn pincushions. Check Out My New Sewing Apron! 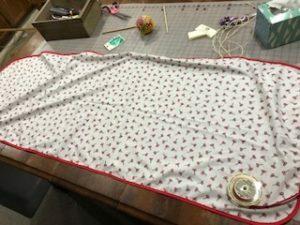 I’ve been teaching my sewing classes for over eight years now, but it took a while to realize I would need a sewing apron to make the job easier! When I first began teaching, I was always running back and forth through the studio to grab supplies to help the students. This gave me quite the workout, but it was also frustrating not having everything on-hand whenever I needed it. Not to mention, this made it much easier to lose things in the process! This process went on for a while, until I came up with an idea: I could make things much easier on myself by creating a customized sewing apron to fit my needs. This project came in stages, as I tried new things and figured out what worked best. The first version was a simple, 3-pocket apron sewn out of linen. This worked great for a few years, but as I got busier I came to the conclusion that I needed more pockets to hold everything. I sat down and sewed a new sewing apron, which is the one I use today. First, I used some leftover fabric that I had made my sewing machine covers out of (along with some twill tape), so that my apron would match my new studio. (Haven’t seen my new sewing machine covers? Click here to see them!). I then sewed two rows of pockets across the front, which would be ideal for organizing my supplies. The top row has small, narrow pockets – necessary for organizing my sewing gauge, fabric marking tools, writing pens, and other skinny, narrow objects. 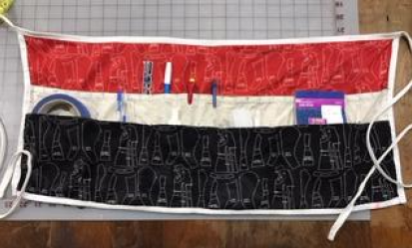 I sewed larger pockets for the bottom row to hold things like my painters tape (to be a sewing guide on the sewing machine), receipt book, seam rippers, small screwdrivers, bobbins, cough drops, chapstick, etc. I absolutely love my new sewing apron – it’s extremely useful! Now I have everything I need at all times, right at my fingertips. One of my favorite things about my new sewing apron is that I can use it for a variety of activities. For example, it makes things like gardening, cooking, and cleaning much easier! 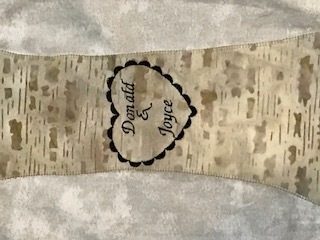 Once you sew something you love, try to think up new, creative ways to use it. The more versatile your creation, the more you’ll appreciate it (and the less extra items you’ll have to sew unnecessarily). Stay tuned for my next blog, where I’ll show you my new ironing board cover. Today I’ll be showcasing my latest project: new sewing machine covers! One of my greatest delights comes from being able to sew something myself, rather than purchasing it from a store. I love taking ordinary materials, and transforming them into something functional and fun. As a result, almost everything in my sewing studio is hand-sewn by me! 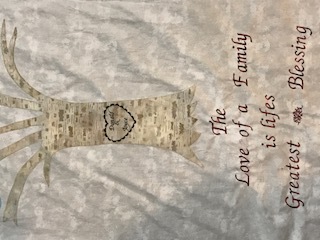 My sewing students love walking through my studio, pointing to things and asking, “Did you make this? How about that?” This has inspired me to continue sewing new pieces to show my kids that, when you put your mind to it, you can create something that looks just as good (if not better) than what you can buy from a store. One of my most recent projects has been sewing brand new sewing machine covers for my studio sewing machines. This has been such a fun project, since I’ve gotten the opportunity to work with different fabrics and piece together a creative and cohesive look for my studio. First, I found some fun fabric in three different colors: red, white, and black. This was perfect for me, since it would match the new décor in my studio. I also gathered some fun looking buttons, as well as some twill tape with measuring tape printed on it. This would work as my trim. Then, I went to work on my sewing covers. I must say, these came out even better than I expected them to! Plus, I was able to use my creativity to come up with a truly unique design that is a reflection of my unique style. The kids love them! If you are sewing something for yourself, make it your own! Get creative and choose fabrics and accessories that you love. Don’t be afraid to take a risk, or to try something new. Remember: you can always change something if you want to. However, these projects often turn out much better than you’d expect! By making something your own, you can be proud of the work you put in, and the piece will truly be a reflection of you. Stay tuned for next month’s blog, where I’ll tell you all about my new sewing apron. In the summer heat, Christmas might feel far away, but it’s never too early to start scheming what handmade gifts you want to make for friends and loved ones. Last Christmas, I made this bag for Heather, a dear friend. She likes big bags to carry all her treasures, and has a variety of bags for different purposes. Though I’m not sure what she uses this one for; I thought of her when I saw this pattern. One of the things I like is that this bag has many pockets, but is not your traditional bag. It has personality! It seemed like the perfect fit. For the fabric, I chose two colors from the same color palette. One has big bright flowers and the other stripes in the same colors. I love the outside pocket on each side and pockets on the inside. The magnetic closure is the perfect touch. It was so fun to make! One of the fun parts is overcoming a challenge, and the handle gave me a bit of trouble. I took it apart a couple of times to get it to lay just right. The satisfaction of getting it just so is tremendous! The final result is just delightful! This would make a great beach bag or farmers market bag. The pattern I used (Butterick B5658) has several different styles. Make one for you and a friend or one of each for all of your bag needs. As everyone knows, Oregon and rain go hand in hand, at least during this part of the year! When I arrived Oregon for the first time, I was 20 and came to visit a high school friend living in Corvallis. What a wonderful place! I just loved it. I visited during November and the whole time I was here it was raining this light mist. Everything seemed to explode with different colors of green. Not long after, I moved to Corvallis and vowed never to take the wonderful trees and the green landscape for granted. I have now lived in Oregon for over 30 years, in Corvallis, Salem, and Portland. Umbrellas are a necessity in this climate. 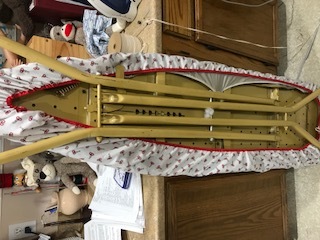 A while ago, a student asked me to help her make an umbrella kit that she bought from Cool Cottons, a fantastic fabric store on Hawthorne in SE Portland. Ever since then, I’ve wanted to make my own. So here it is! I had such fun with this, from picking the fabric to the quick and simple assembly. It’s very easy to make; you just purchase the frame and pattern, all available at Cool Cottons. 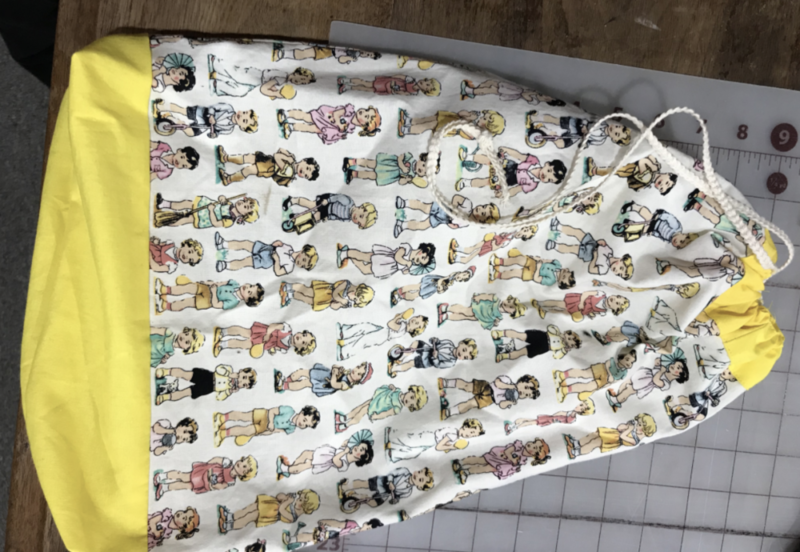 There is only one pattern piece that you cut out 8 times, sew them together, and finish the seams. You put the finished cover on the frame, tack it down, and waterproof the fabric. Voila! You have your very own Oregon Umbrella. 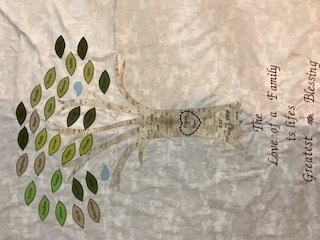 It’s such a joy to create things that are unique and further make it your own, matching your personality and interests. As you can see in the pictures, I made my umbrella a sewing theme, with a tape measure cotton fabric pattern. This would be a great project for any of you to try! Stretch your wings and try something out of the ordinary.